What do building regulation changes mean for solar PV in Tasmania? Home » CPDevents » What do building regulation changes mean for solar PV in Tasmania? Update 27 Nov: the Hon. David O’Byrne, Minister for Workplace Relations will be joining us for the first part of our Hobart event tomorrow. Please arrive by 5pm if possible. Tasmanian building regulations covering solar PV installations changed on 6 November. Join us to find out everything you need to know about the changes. Light refreshments provided. Drinks and meals available at bar prices. 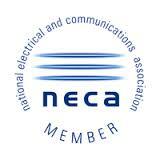 CEC accredited installers and designers will earn 40 CPD points for participating. Why were the changes made? Which installations will need a building permit and which are exempt? What is the role of the building surveyor and structural engineer in assessing more complex installations? Plenty of opportunity for questions and discussion. Admission: $30, free for TREA members (you can join on the night and we will invoice you). Please arrive by 5:15pm for a 5:30 sharp start. Formal presentations finish by 8pm. You’re welcome to join us for a meal and informal discussion afterwards. 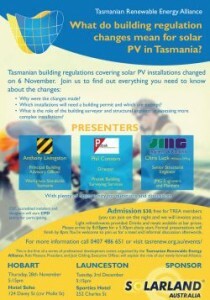 This is the first of a series of professional development events organised by the Tasmanian Renewable Energy Alliance. Rob Manson, President and Jack Gilding, Executive Officer will explain the role of our newly formed Alliance.